We love family traditions, especially around the Holidays! With my (Anthony) mom's family, we would always go to my Aunt and Uncle's for Christmas Eve, where they would roast a huge prime rib, have tons of friends and family over and drink plenty of Budweiser. At 11PM, we'd go to the midnight service at our church which ended in a candlelight singing of "Silent Night." At Uncle John and Aunt Patti's there were some great memories. Every year, we'd write "Twelve Days of Christmas" which were resolutions/wishes for the next year. They'd be sealed in an envelope and not read until the next Christmas Eve. The kids would also put out "reindeer food" for the reindeer (which would sometimes get eaten by the neighbors' horses if they got out). It was always a great night. Early Christmas morning, Josh, Johnny, and Jason, our three first cousins would always come over around 8AM with a bottle of Bailey's and a case of Budweiser to kick off the day and see what we (the younger cousins) had gotten from Santa. On the Rotio side, when I was a kid, we used to always go to Uncle Frankie's for Christmas breakfast. We'd have SO many different kinds of food to choose from. My first memory of one of those breakfasts was being there and being given a shot of orange juice (to be able to fit in with the adults who were drinking screwdrivers) and I was told, "There is every breakfast food you can think of!" As a 5 or 6 year old I said, "Where are the donuts?" which there were none of ... what a brat! We'd always do two meals in the afternoon at Pop-Pop's and Grandma-ma's. Italian was scheduled at noon (though it usually happened around 1PM) and the traditional American meal around 5 or 6 - with dessert in-between. And more Budweiser than any one family could possibly drink. The Italian was scheduled like clockwork: always Ravioli at Thanksgiving, Lasagna at Christmas, and Manicotti at Easter, with pork and meatballs cooked in sauce, salad, plenty of bread and butter, and great stories, conversations, and the occasional argument :) holidays are the best! Mom's creampuffs, Grandma-ma's bourbon balls, and Aunt Dotsy's cookies always made an appearance at dessert with plenty of other assorted pies. Pop-pop would play any song you could think of on piano. He taught himself by ear, everything was chords, and he'd sing the whole time, I remember it as beautiful and rowdy and superhuman all at the same time. My brother, LJ, seemed to make a point of always eating more manicotti than anyone else. One year in college, I brought home a teammate, Josue, who was a 260lb D-End who could bench 525lbs. Josue ate 11 manicotti.. LJ made a point to put down 12. As a 6'1" 235lb man myself, I still can't even understand how that was humanly possible for my brother at 175lbs. Ok, Katie here. I haven't made an appearance on the new Rotiofood.com, so here goes. My family traditions for Christmas Eve and Christmas Day were very similar to Anthony's (except for the two-meal thing! ), and honestly I could write a book with all my memories. But I think my favorite family traditions at Christmas time actually centered around the beginning of the holiday season. There's something about that first week of Advent that is just really special. On the first of December, my mom would break out her hand-made Advent calendar to hang on the back of the kitchen door. It was a quilted calendar, with a tree on the top and three rows of little pockets on the bottom, each numbered with a day of the Advent calendar and filled with a surprise ornament to be hung on the tree above. My sister Molly always got to hang the Dec 1st ornament since it was her birthday, but we'd take turns the rest of the month. One weekend of the month (Molly and I always begged for it to be as soon as possible, obviously) we'd plan to go get a Christmas tree. We always went out to a farm outside of the metro-Boston area (usually an hour away, or more the few times we got lost!) and cut it down ourselves. Somehow we always ended up going in the later part of the day so we were struggling to pick it out before dark. As soon as we got home, Dad would put on the lights while the rest of us set up the other decorations throughout the house -- the nativity scene on the bookcase, the glass bells hung in between the dining and living rooms, the nutcracker collection on the sideboard... Once Dad was done with the lights, we'd throw on Fred Waring's Christmas album, pour some egg nog (spiked for mom and dad, virgin for Molly and me) and get those ornaments on. Molly's favorite was always this plastic freebie we got at the Shell station -- an Energizer bunny. We loved to sneak it onto the front and center part of the tree and see how long it would take mom and dad to notice. When the tree was sufficiently trimmed, it was time to get dinner ready. 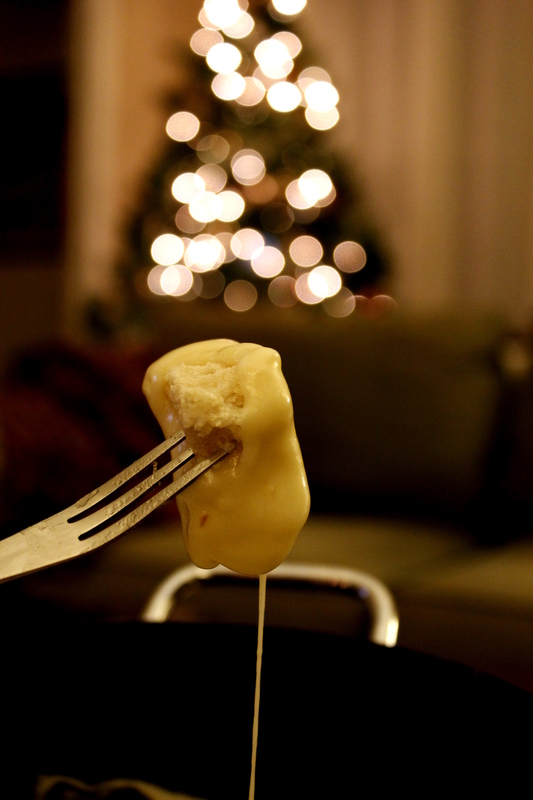 Every year, for as long as I can remember, the dinner for this special night in our house was cheese fondue. My memory is that Mom would usually vacuum the tree needles and put all the boxes away, Molly and I would set the table, and Dad would prep dinner. Cheese fondue is literally white wine, cheese, and garlic, melted and served in a special pot with a candle underneath to keep it warm and smooth. And you dip toasted chunks of crusty bread into it. Could anything be more delicious? The only thing that makes it even better is dimming all the lights and eating by the light of the freshly trimmed Christmas tree. This year, we kept the tradition alive in our newlywed household. 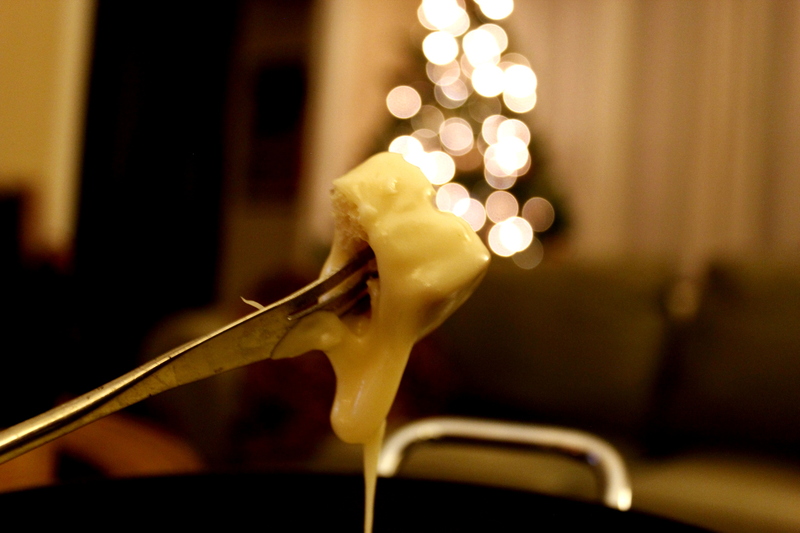 We went out and cut down a tree at Eckert's Farm in Illinois, set it all up with a Nog in hand, and to the proper soundtrack, and served up a delicious cheese fondue made from scratch. There are a ton of recipes out there for fondue, but we think simple is best. It's seriously SO easy; just keep stirring. 2. Place olive oil and garlic into cold pot (thanks for the pots Gram!!). Turn heat on medium and stir continuously. 3. After two minutes, garlic should be sizzling but not yet brown. Add white wine and bring to simmer. 4. Reduce heat to low and begin stirring with spoon again, don't stop until you serve the fondue!. 5. Add cheese one handful at a time, wait until cheese melts completely before adding more, don't stop stirring! 6. When all cheese is added, serve in fondue pot, or eat right out of the pot, keeping heat on low to make sure the fondue stays liquid enough to dip bread into.